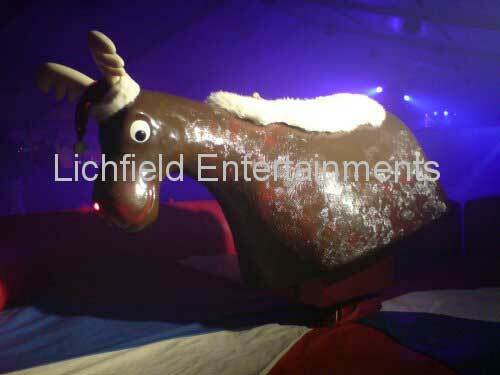 Our Rodeo Reindeer Ride - The ultimate Christmas themed entertainment for your festive fun! Why have a Rodeo Bull at your Christmas Party when you can have a Rodeo Reindeer complete with flashing red nose! Our Rodeo Reindeer is supplied with one of our trained operaters who will safely operate the ride on your behalf. All rides are automatically timed and we provide a free trophy for the best ride. The Rodeo Reindeer needs an area of 17x17ft with a height clearance of 9ft.